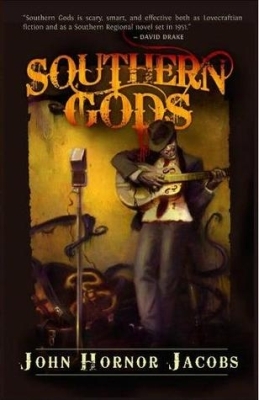 Gods and men clash to the soundtrack of blues in John Hornor Jacobs‘ first novel. Set in 1950s Arkansas, the story follows a hardboiled WW2 veteran as he is hired to locate two men, one of whom makes such music as will drive men to kill. The gumshoe is Bull Ingram; his first target is a record company man who’s disappeared during payola visits to local radio stations. The other man, Ramblin’ John Hastur, is a bluesman, whose crazy tunes about yellow signs and other Lovecraftian thingumajigs are transmitted on pirate radio throughout the South. The setting is brilliant, the atmosphere well developed. The world of murky blues recordings and 50s radio offer a rich and colourful background for Bull to roam in. Jacobs has a natural rhythm to his storytelling and the characters are, for the first half of the novel, compelling creations. Bull’s story reaches its zenith at a blues gig, where the main attraction literally brings the house down. Unfortunately, the second half of the novel gets bogged down in static scenery (it’s mostly set in one house) and too much Lovecraftian exposition. The fine theme of blues, so evident in the first half, fades away. The already pulpy characters get increasingly pulpier; there’s a love interest, Sarah, and a Montenegran priest, Father Andrez, who seems a strangely sane individual for someone who has so much Cthulhu Mythos. All the tantalising mysteries of the first half are explained away in embarrassing detail, and as the story is set in the South, family histories also come into play in a heavy way. However, even in the midst of Derlethian tripe of good versus evil, Jacobs displays an original voice: the take on the eternal struggle is a bit different, the good old Necronomicon gets a new treatment, and instead of a Christian god, it’s an ancient Roman deity that proves to be of most help to our heroes and heroines. Altogether, the first half of the novel is unreservedly great; the second half is a trudge with some small pockets of guilty pleasure. Luckily, Jacobs’ leisurely storytelling and a natural knack for creating atmosphere provide just enough glue to keep the package enjoyably together. But the seams are clearly visible.